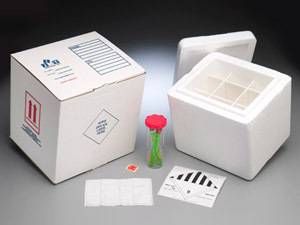 Bioship 602SS DTCK Diagnostic Temperature Control Kit has an airtight pressure vessel (secondary container), complete with biohazard label, absorbent pouch, dry ice label, instructions, positioning insert, cooler and outer fiberboard box. This package system meets all requirements of IATA/ICAO Packing Instruction 650 for air shipment, and all requirements of domestic and international regulations for ground transportation of diagnostic specimens. This kit is for the customer that needs a compliant diagnostic specimen dry ice shipper that they can afford.